One of the first pieces of gear you’ll need for a hike is a backpack. Whether you are hiking a short trail or heading out for a few weeks, a backpack is a necessary piece of gear that will allow you to pack and carry everything you need for your adventure. You can even get camera backpacks and make them a hiking backpack, so you can take gorgeous photos. It is important that you pick the right backpack because you will be wearing it for hours. The best hiking backpacks are an investment and finding the right one can seem overwhelming. Our list of the 10 Best Hiking Backpacks in 2018 provides you with buying information, frequently asked questions, and offers our list of the top hiking backpack considerations. Our goal is to help you choose the best hiking backpack for your needs. The market is flooded with a variety of outdoor brands and each one has their own hiking backpack design and style. Not all the options are investment worthy, so we’ve given you some features to look out for that indicate a high-quality hiking backpack. Choosing a hiking backpack can be quite the process, not to mention, the money. If you are looking to save a little, try seasonal sales and deals. You might find your new hiking companion for a great deal! Just remember, the best hiking backpack will help you climb those peaks and help balance the load on your shoulders. The Scout 3400 Internal Frame Backpack by TETON Sports is not your basic backpack. This rugged hiking bag has an internal frame and is made to fit. This pack is great for 2-4 day long adventures. 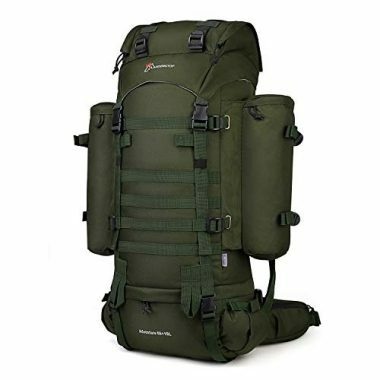 It is a 55L Pack that is lightweight. The bag has a sleeping bag compartment, multi-directional compression straps, and multiple compartments and pockets. You can strategically pack this trekking backpack for your back-country adventure. The multi-directional compression straps also give you external storage options, which makes organization easier. There is a bungee storage system to quickly store jackets for easy access. There is also an integrated and sewn-in rainfly that ensures your gear and pack stay dry in wet conditions. This top rated hiking pack is designed with comfort in mind. There are padded shoulder straps and a padded back panel with a channel for airflow. The shoulder straps have thick pads and upper load adjustment straps. The padded back pad has open-cell foam and molded channels. The airflow will maximize your comfort by helping sweat dry. All the components of this walking backpack can be customized in fit. From the chest, shoulders, and waist, this bag will fit your torso perfectly. You will easily carry heavy loads for longer. Due to the customized fit, this pack can be used by men, women, and children. This hiking bag is made of 600D diamond ripstop and 600D Oxford canvas shell. This bag can stand up to years of rugged use. Even better, this bag is affordable. TETON Sports delivers trusted quality in a coast that won’t break the bank. They also include their Lifetime Warranty to ensure you are always supported. Get outdoors and enjoy life with the Scout 3400 hiking backpack. 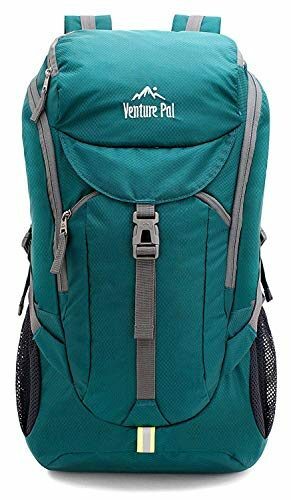 The Lightweight Hiking Daypack Backpack by Venture Pal is compact and handy. This hiking bag is 35L and made with tear and water-resistant nylon material that is high-quality. This nylon material saves on weight but delivers extra-strength and a lasting performance. There is a double layer bottom piece, so you can confidently carry a heavier load. 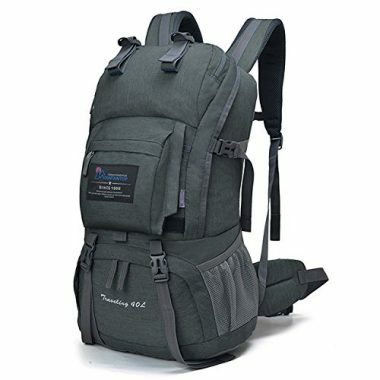 There are also heavy-duty two-way SBS metal zippers and bar tacks at major stress points to ensure this trekking backpack can manage the load. The shoulder pads have sponge padding with breathable mesh to ensure you are comfortable. The length of the shoulder straps is adjustable. There is also a chest strap with a locking whistle buckle to keep your bag secure. To keep things organized, this backpack for hiking has multiple compartments to store your gear. There is one main zippered compartment, two zippered front pockets, and two side pockets. The main compartment has two separators to further organize things. The front pockets can conveniently hold small items and the two side pockets are great for water bottles. This top rated hiking pack is also extremely compact. A true space saver, this backpack can be folded down into its own pocket for easy storage. If you are traveling on a plane, this feature can also save you from having to pay for an extra bag. Venture Pal has designed a backpack that is great for everyday and multipurpose use. From vacations to the dusty trails, this hiking bag can be your #1 companion. Venture Pal promises this backpack will always be there for you with their Lifetime Warranty. Whatever it takes, they will ensure you always have a hiking bag. Exchange? Return? No problem! 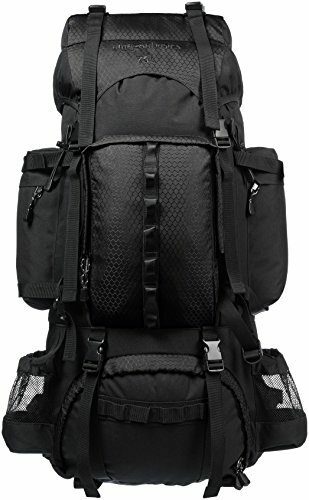 This hiking bag is the same Venture Pal design as the above listed model, but it is smaller. 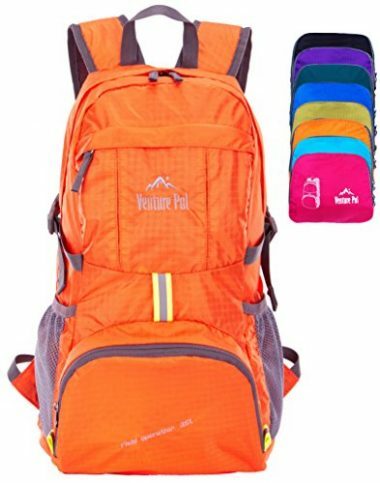 This Small Lightweight Hiking Daypack Backpack by Venture Pal offers 25L of gear space. Venture Pal knows life is always in motion and your essentials need to go with you! This small hiking bag ensures you travel easily and stylishly. This backpack for hiking is made of polyester that is high-quality. The bag is tear and water-resistant for long-lasting durability that you can rely on. There are heavy-duty two-way SBS metal zippers and bar tacks at major stress points to enhance this bags longevity. The bag has multiple compartments to make organization easy. There is one main compartment, two outer zipped pockets, and two mesh pockets. The outer pockets are great for quick access and the mesh pockets fit a water bottle perfectly. There is breathable mesh padding on the shoulder straps, so you can comfortably carry this hiking bag all day. Your shoulders will stay cool and dry, so you can focus on the path ahead. This walking backpack isn’t just super comfortable, it is also ultra-compact. This design can be folded and tucked into the front pocket for easy airplane travel and storage. This backpack is ideal for a variety of activities. From every day use to day hikes, this bag is a reliable companion. Venture Pal backs their hiking bag with a promise that it will always be there for you. With their Lifetime Warranty, you can exchange, return, or do whatever it takes to have a functioning backpack. This bag is also easily washed, so you can play in the dirt without worry. This Hiking Backpack with Waterproof Rain Cover by Outdoor Master is the only backpack you need to hit the trails. This multipurpose trekking backpack holds 50L, which gives you spacious volume to pack your gear. This hiking bag is made of lightweight material that doesn’t skimp on durability or comfort. This trekking backpack has padded S-curved shoulder straps that are adjustable and mesh ventilation. The adjustable straps can be customized to give a snug fit to ensure your pack isn’t swaying around as you hike. As well, there is a foam padded hip belt to help ease the weight of your load and further secure the backpack. There is a top mounted reinforced handle, so you can haul this bag anywhere. Thanks to the adjustable shoulder straps and hip belt, anyone can use this pack. This hiking bag is a great option for both men and women. This top rated hiking pack also features plenty of pockets that are both large and small. There is a padded laptop compartment to keep your technology safe too! With external attachment points, you can easily carry your hydration reservoir, tent, trekking poles, sleeping bag, and any other gear you can think of. This hiking bag will hold everything you need for your next adventure. For even more gear protection, Outdoor Master has included a waterproof rain cover. This waterproof rain cover can be easily stored until the moment you need it to keep your gear dry. With this purchase you will get 1 hiking 50L backpack, 1 waterproof rain cover, and a 6-month 100% Satisfaction Guarantee Warranty by Outdoor Master. 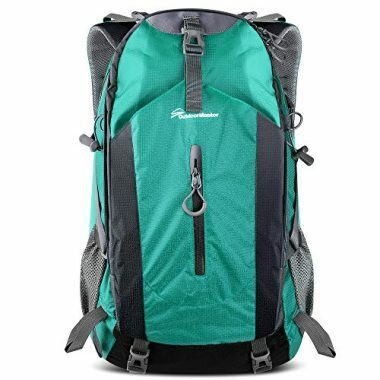 The Internal Frame Hiking Backpack by Amazon Basics is made of durably polyester, which makes it ideal for hiking and camping. This trekking backpack delivers a reliable performance and offers loads of space for your must-have on the trail essentials. This hiking bag ensures that you will have a comfortable fit as it is fully adjustable around your torso. There are adjustable shoulder straps that are also thickly padded. There is also an open-cell foam lumbar pad that has molded channels to give your lower back comfort and support. You can adjust both the shoulder pads and the lumbar pad to ensure that your pack is snug against your body and secure on the trail. All the adjustability ensures there is a good upper-load balance, so you aren’t toppling over. This pack design accommodates men, women, and children. This pack also features extensive storage pockets and compartments for all your gear. There is a large sleeping bag compartment and multi-directional compression straps to help you organize and control your gear. For even more storage space, there is an optional extension collar that delivers an extra 5L of space for your gear. Your gear is also well protected thanks to the water-repellant exterior, which can protect against light rain. For heavier rain, there is an integrated water-resistant rainfly. For heavier rain, there is an included waterproof cover that can be easily stored and tucked away, when not in use. This Hiking Backpack for Outdoor Camping by MOUNTAINTOP delivers 40L of storage space with 6 adjustable straps to balance out all the weight. This backpack for hiking features 6 straps that can be used for a variety of your gear. You can tie up and hang your sleeping bag, sleeping mat, hammock, tripod, and many other gear items easily. There is also plenty of storage. There is one compartment with an internal mesh pouch and a front pocket. You can pack a 17-inch laptop with ease or use the space to hold your water bladder. There is also a bottom zipped access compartment for gear like a sleeping bag or jacket. There is a top-notch bearing system that can be fully adjusted. There is a sternum strap, back panel that is breathable and molded, as well as S-shaped shoulder straps. There is also a hip belt to help you carry the weight, but it is not moveable. You can only adjust the tightness of the belt. On the S-shaped shoulder straps there are also D shaped hooks, so you can attach small gear and from the front adjustable straps, you can attach your trekking poles or tripod. The material of this hiking bag is water-resistant, so you can’t wash it with liquid detergent or bleach to ensure it doesn’t breakdown the fabric. You should air dry this bag and never iron it. 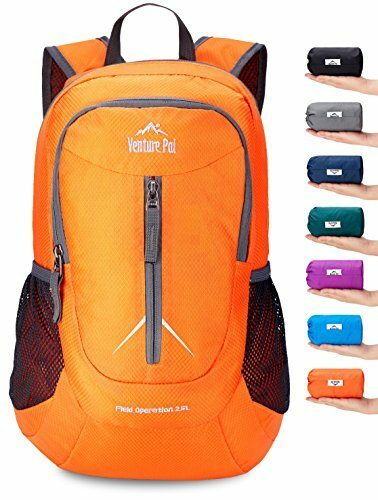 This bag is the same design as the two previously listed backpacks by Venture Pal, except that this bag is the large sized pack. This bag holds 50L and is equipped with a large compartment and many pockets. Your gear will be well organized during your excursion. This bag is durable and made of water-resistant nylon. There are reinforced two-way SBS metal zippers and double bar tacks at major stress points for load bearing support. This backpack has breathable mesh shoulder straps to ensure you are always comfortable. This backpack is a true space saver because it folds up into an easy to carry pouch, which means you can take it anywhere. From hiking, climb, and camping, this backpack will always be a reliable venture pal. 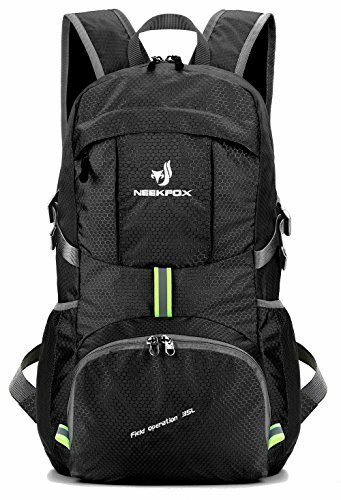 This Ultralight Hiking Backpack by NEEKFOX is made of rip-stop material that saves on weight but delivers in toughness. This hiking bag features quality thickened nylon fabric that can withstand heavier loads for all of your travel needs. This walking backpack has a 35L capacity and multiple compartments to keep your gear organized. There is a zip main compartment, two front zip pockets, two mesh side pockets, and several internal pockets too. You can put a 13-inch laptop in the main compartment and still have space to spare. The mesh side pockets can hold a 40-ounce water bottle, so you stay hydrated on the trail. You also won’t have to struggle with the zippers because they are smooth moving and won’t catch on any flaps. 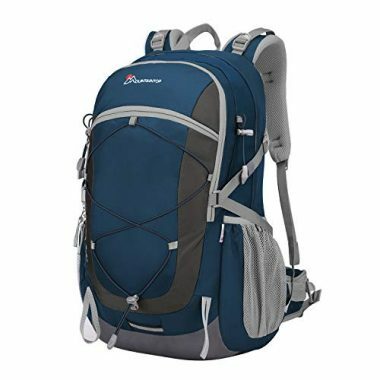 For your comfort, this top hiking backpack has S-shaped shoulder straps that are adjustable and breathable. The S-shape helps distribute the weight, which relieves stress and makes you feel comfortable on your trip. The stress points are reinforced for extra durability and allow you to carry up to 44 pounds of gear weight. The double bottom layer helps carry this weight and ensures the longevity of your backpack. This backpack is also water-resistant, ensuring that if you are caught in the rain your gear will stay dry while you seek shelter. It is also puncture resistant, to ensure nothing can penetrate the side or bottom of your bag. The nylon material that makes this bag water and puncture resistant also makes it extremely compact. This backpack can fold into its own zip pocket for easy storage and transportation. With NEEKFOX you also get a Lifetime Satisfaction Guarantee. The Unisex Hiking Backpack by MOUNTAINTOP is a top rated hiking pack that features a water-resistant coating. This bag is made of nylon and polyester fabrics, which makes it hard for water to penetrate inside the material. The nylon and polyester fabrics also make this bag lightweight, so you aren’t stuck carrying unnecessary weight on the trail. This backpack has plenty of organization available. There are hip belt pockets, a bladder sleeve, two front pockets, two mesh pouches, an internal mesh pouch, and a laptop compartment. The laptop compartment is padded and comes with an adjustable snap to ensure your technology is held snuggly and isn’t jostled around. There is also a front loop that you can use to soft latch items, like a jacket, to your bag. Attachment points also allow you to hand an ice ax or hiking poles from a bottom loop. Both sides of the shoulder straps have a D-shaped hook for attaching smaller items. The load bearing system features deep and densely padded shoulder straps and a hip belt that promotes air circulation. Your back and shoulders will feel cool and appreciate the load bearing assistance. There is also a sternum strap which has a buckle that features a built-in emergency whistle. On the outside of the bag there is a 3M reflective band to enhance your safety and ensure that you are always visible to your fellow outdoor adventurers. This Tactical Military Hiking Backpack by Mardingtop features an internal frame and MOLLE rucksack design. This backpack supports itself and helps you carry the weight, thanks to the internal frame. The MOLLE system is a military organization system that used nylon webbing straps and loops to organize your gear. You can hang tools, trekking poles, tents, sleeping bags, and other accessories from the MOLLE design system. This backpack is made of 600D polyester that is water-resistant. However, for additional rain protection, there is a rain cover included. There are YKK zippers to ensure that all the seams are strong enough to bear the weight. This hiking bag opens with a top lid that has its own small compartment to store things like maps, tools, and keys. For more organization, there are side detachable pockets that can hold 1000ml water bottles. The side pockets of this bag are perfect for holding your snacks. For your comfort, there are chest straps to help you cope with the weight while you are on the road. There is also a breathable padded waist belt that can fit a waist up to 49 inches. To further your comfort Mardingtop includes their 90 Day Limited Warranty. When you are deciding which hiking backpack is the best to buy, it is important to consider a few key features. You will have to decide which hiking backpack design best suits your needs. There are many different styles, materials, and fits for you to choose from and there are elements of each design that can enhance your time on the trail. Hiking backpacks are an easy way to carry all the gear you need. You can bring a tent, food, clothes, and survival gear in one hiking backpack. Whether you are laying low or climbing high, a hiking backpack is a great investment to add to your collection of outdoor gear. It is best to consider the differences of each design and see what features of each hiking backpack might best suit your needs. Here, we have made a guide of some features of a hiking backpack design that you should consider before making a purchase. As well, we have some frequently asked questions and their provided answers to give you all the up to date information. With this guide, you will have the ability to confidently choose a hiking backpack for you! With hiking backpacks, comfort is crucial to its design. Comfort is one of the top factors you should consider when investing in a hiking backpack. You will be carrying this backpack for miles and possibly weeks, so having a design that feels good on your body can make all the different between an enthusiastic hiker and an irritable one. The heavier the load is to carry, the more support it will need. Heavy loads will 100% need the extra support of a hip belt, so that you can evenly distribute the weight around your body and keep the strain off your shoulders and back. Your hips are strong. They can endure carrying more weight for longer times, without tiring as quickly as your shoulders and back. A hip belt allows you to rest the majority of the weight on your hips, leaving minimal work for your shoulders and back. A comfortable backpack will have a strong and padded hip belt. It is even better if there is ventilation to help keep you cool. As well, your backpack should be fully adjustable. Having straps from the shoulders to the hip that are adjustable allows you to find the perfect fit and balance for all the weight of your gear. To be completely honest, the more money you spend on a hiking backpack the better off you’ll be. The best hiking backpacks are costly, and you get what you pay for. High quality hiking backpacks don’t come cheap. The market will always have some good value options, but you should think of your hiking backpack as an investment. If you find the right design that is comfortable for you and it is high-quality, it can last you for years. 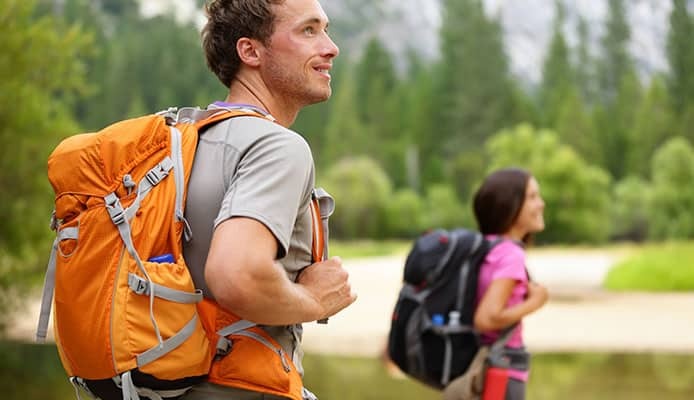 Investing in a top rated hiking backpack allows you to reap the benefits of not only the backpack’s design, but the manufacturer’s warranties as well. 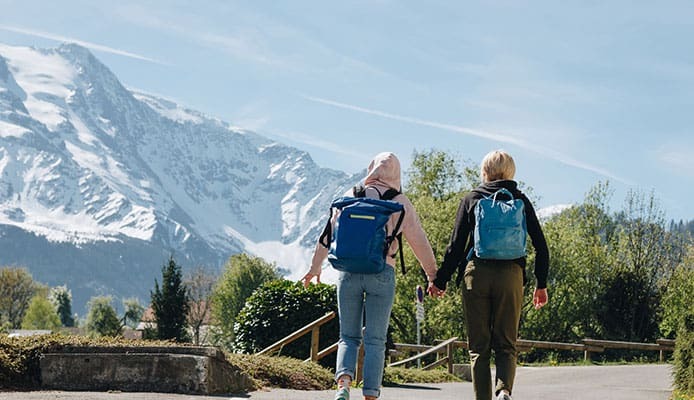 Most high-end hiking backpacks that are made by reputable companies are backed by the company’s standard, which means lifetime guarantees for repairs and replacements. When you find the best hiking backpack for you and invest, you aren’t just getting the perfect trail companion. You are getting one that is guaranteed to last you throughout your life. The cost may be expensive upfront, but the value of your hiking backpack will extend beyond the years and monetary cost. The best backpack will have you making lifelong memories. Lightweight. Lightweight. Lightweight. When you are using a hiking backpack to carry your gear, you don’t want to put a lot of weight in the primary item. You should find a balance between lightweight and durable. The best hiking backpacks are all lightweight, but some are more than others. While it is important to have a lighter hiking backpack, there is a difference between lightweight and ultra-lightweight. As stated, most hiking backpacks are lightweight, but there are ultra-lightweight backpacks too. An ultra-lightweight backpack cuts down a few more ounces at most, but it may not be the best for you. Hiking backpacks that are ultra-lightweight are normally made of thinner material. This can mean that an ultra-lightweight hiking backpack may not be as durable as you need. If you are tossing the backpack and around and using it extensively, an ultra-lightweight design will break in a fairly short time period because it just can’t handle the extensive use. If weight is a concern for you, perhaps consider using a daypack style hiking backpack. A daypack will minimize the weight of your backpack and be a smaller, more compact size. Ultra-light backpacks are great if you aren’t planning on carrying a lot of gear and you won’t be using it daily for multiple hours. A lightweight hiking backpack should be sturdy enough for you to be a little rough and it’ll still last throughout the years. You want your hiking backpack to be rough and tough, especially if you plan on giving it a beating on the trail. A high-quality hiking backpack can take daily and persistent use throughout the years, without falling apart. Most hiking backpack designs are tough because they know you are relying on them to lug your other gear along. The best hiking backpack you can invest in will be tough in another way too. A water-resistant hiking backpack is a great way to keep your gear dry and help preserve the lifetime of your bag. With the added water resistance, your hiking backpack will have an even better chance at beating the weather. However, no hiking backpack can last forever. A hiking backpack that is used frequently eventually will wear down. Or accidents can always happen, and damage can occur. A durable hiking backpack with also come with a top-notch warranty. Look for a brand that backs their hiking backpack with a Lifetime Warranty. Depending on the level and duration of the hikes you are doing, a hiking backpack that has a frame can be very useful on the trail. A frame gives the hiking backpack structural support. It keeps the bag upright, which means the weight is stabilized, as well as held closer to your body. With a frame, a hiking backpack can’t slouch and that can make all the difference when you are carrying heavy weight. The frame is made out of rods that are strategically placed into the design of the hiking backpack, at points where extra structure and stability help the most. There are two types of frames for hiking backpacks. There is an external frame and an internal frame. 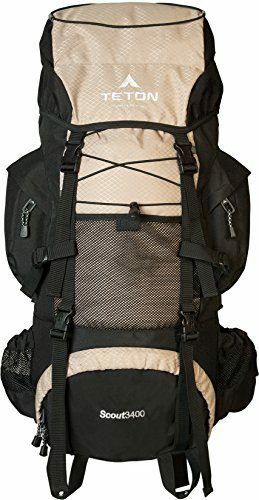 External frame backpacks are rather old fashioned because there has been a modern advancement in the design of hiking backpacks. External frame backpacks will have the frame on the outside. This means that it can be seen and is quite bulky. External frame backpacks are quite a bit heavier. The frame can also get in the way of your head space, which can be an annoyance. External frames are not as practical anymore and they aren’t as common to see. Internal frame backpacks are the way to go. If you want or need the added structural support, internal frames can greatly assist a hiking backpack in evenly distributing the weight. Internal frames will have the support rods built into the backpack. This means that you won’t be able to see the frame from the outside and most likely, not the inside either. Modern hiking backpacks are excellent at integrating the frame into a non-intrusive design that you can feel, but not necessarily see. Hard parts of the frame will most likely be covered in a padding, so it isn’t immediately obvious that part of the frame is there. While frame making hiking easier, it isn’t always necessary for you to have them; depending on your situation. Frames are built for heavier loads and generally, only larger sized hiking bags will have them. Most daypack style hiking backpacks will not have a frame because they cannot carry as heavy a load. If you are packing light, you shouldn’t need a frame. In fact, if you pack light enough, a frame is just unnecessary weight on the trail. Volume is a measurement, commonly in liters, of how much your hiking backpack will hold. For hiking backpacks, smaller is better. While they may seem contrary to popular belief, having a smaller volume can help you economize your space and carry less weight. To determine the size of volume you need, you should take into consideration your activity, the time you will be away, and how much gear you need to carry. You should always buy a bag that fits exactly what you need or is smaller. If you buy a big backpack, but don’t fill it completely, chances are you’ll have the urge to fill it. Often, when you fill a bag that is bigger than your needs, you end up carrying unnecessary weight. If you can afford it, it might be best to invest in two hiking backpacks. Some hikers enjoy having a set of hiking backpacks with one that is larger and the other smaller. In general, for bigger expeditions, a 70L hiking backpack is a good choice in volume for your gear. For smaller expeditions, a 30L backpack is a good choice in volume for your gear. Most daypack style hiking backpacks will be 30L or less. If you are going to be hiking in cold and snowy conditions, you might consider sizing up. While this is contrary to the, smaller is better idea, snow gear can take up a lot of space. For example, even if you aren’t packing a lot and are choosing to take along a 30L hiking backpack and the weight of your summer and winter gear is the same, the space your winter gear takes up may not be. A 30L pack for the summer could easily fit your gear without weighing a lot. Snow gear could weigh the same as your summer gear but may not fit in a 30L pack because some of the gear, like warm layers, are puffier. Warm layers will take up more space, which requires a larger pack. A general guide to how many liters you need can be determine by the duration of your trip. For trips that are 1-3 days long, a 35-50 liter pack is a good choice. For trips that are 3-5 days, 50-70 liters should do. For long trips that are 6 days or more, you should look at packs that are at least 70 liters, if not larger. Volume is one aspect of the size of your bag, but there is also the size in terms of how your hiking backpack fits your body. Aside from choosing the size volume you need, you will need to find the size that correlates best to your torso. Torso length is more important than height to determine the size bag you need. The common bag sizes are extra small, small, medium/regular, and large/tall. Here is a general guide for how manufacturers determine what size bag fits what torso. Extra Small: Up to 15 ½ inches. Small: 16 to 17 inches. Medium/Regular: 18 to 19 ½ inches. Large/Tall: 20 inches and up. To find your hiking backpack size, you can measure yourself at home or in store. At home you will need a friend to help and the benefit of going in store is that there should be a representative who is knowledgeable in hiking backpack sizes to help you find the best fit. To find your measurements you will have to use a flexible tape measure. Tilt your head forward and have the person helping you feel for a bony bump that is at the base of your neck. The bony bump is your C7 vertebrae and marks the top end of your torso length. Starting at that point, you measure down to your hip bones. The hip bones mark the bottom of your torso length. A good way to find your hip bone and where to measure to, is to rest your hands comfortably on your hips. Your thumbs should point to a place on your back and this point is where you will stop the measurement. The torso length is the distance between your C7 vertebrae and your hip bones. For women’s and kids hiking backpacks, manufacturers may have a specific backpack that fits their bodies better. There are also unisex packs, but most women will find a pack catered to their torso is more comfortable and has a better fit. Hiking backpacks that are designed with women in mind will work well with the shorter torso lengths, narrow shoulders, and curved waist. For the youth hikers, a youth specific pack can be great because it has a better fit, but it also has a smaller volume. Some youth packs have an adjustable suspension that can be changed as the child grows. Material is important when it comes to the durability and weight of your hiking backpack. Hiking is an outdoor sport and hikers know that they are bound to face different weather elements on the trail. From rain and snow to scorching heat, hikers can face anything while out in the wilderness. The best hikers plan ahead and have gear that is prepared for the weather too. A material that is water resistant, tear resistant, and quick-drying will be the best for a hiking backpack. Hiking backpacks that are water resistant have two abilities; they can keep your gear dry and protect themselves too. A water-resistant hiking backpack is more durable because it won’t be phased by rain or snow. The material won’t risk a buildup of mold or rot because it is better at resisting water and not allowing it to penetrate the material of the bag. Waterproof backpacks may be even better because it can be ultra-protective. However, it’s important to learn the difference between a water resistant vs. waterproof backpack to help determine what would best suit you. You can also invest in product like backpack rain covers and waterproofing sprays to provide extra protection. A tear resistant hiking backpack can withstand a rugged trail. Accidental bumps or scrapes against rocks shouldn’t tear a hole in the side of your bag. You can confidently set the backpack down on a bumpy surface without worrying that a rock could cut a hole in the bottom. As well, any snag on branches should be easily brushed off without damaging the material. On top of the water resistance, a bag that is quick drying has less chance to acquire a buildup of harmful mold or rot. Plus, a quick-drying hiking backpack means that you aren’t having to lug around a soaking sack along the trail. Water is heavy, and a soaked backpack can put a major damper on your hike. Ventilated backpacks can be a great investment as they have quick dry features and helps keep you cool. If you are curious if you need a ventilation, you can learn how ventilated backpacks work before you make a purchase. The material of your hiking backpack also affects how much it weighs before it is packed full of your gear. The base weight of your hiking backpack should be minimal. A way for backpacks to save on weight is to be made of lightweight, but durable materials. Nylon is a great lightweight material that is water resistant and durable. It can be affordable for most hikers. A more expensive material that is worth the investment is called Dyneema. Dyneema is a lightweight and resistant material that can help you save a few ounces. Modern style hiking backpacks are generally, very attractive looking bags. We can’t blame hikers for wanting to have a backpack that functions well and makes them look cool on the trail. Since hiking backpacks are an investment, most users would also like the backpack to be stylish. Every hiker has a personal style and manufacturers keep this in mind when designing their hiking backpacks. There are many different styles, designs, and colors to choose from on the hiking backpack market. From tactical backpacks to roll top backpacks, there should be plenty of options for hikers to find a bag that they think looks cool and is practical. Some of the top backpack brands that are popular amongst users are Patagonia backpacks and North Face backpacks. You can even take your dog along hiking and get dog backpacks too! Q: What is the difference between a backpacking and hiking backpack? A: In general, the difference between a backpacking and hiking backpack comes down to the details. However, it may be best to define the difference between backpacking and hiking. Or attempting to define it because everyone has their own specific ideas. Backpacking and hiking can mostly be defined by the amount of time on the trail and what you are carrying with you. Backpacking commonly means you will be going out in the wilderness and setting up one or more overnight camps. Backpackers normally spend days out on the trail and sometimes even weeks or months, in extreme treks. Due to the time spent on the trail, backpacking means that you have to carry all your gear with you. Typical gear includes your clothes, tent, kitchen, survival tools, and any other extras. Backpacking normally means you will go to the rugged wilderness, so don’t expect to find man made trails. Hiking is commonly thought of as a day activity. Hikers head out for one day or less and return to a base location. Hiking can also have a large range of trail conditions. Some hikes are man-made and constructed, so they are easy to walk. Others are off the beaten trail. However, due to the shorter amount of time on the trail, you don’t have to carry everything with you. A few extra layers, some survival gear, and a few snacks should safely get you through a day of hiking. When it comes to the differences in backpacking and hiking backpacks it comes down to the volume, frame, and some added features. Backpacking backpacks need to be big. Really big. Most backpackers need to carry a 60L or 70L pack to fit all their gear. This can change however, if people backpack in groups and share the weight. Some women may only carry a 50L or 60L pack because they have a partner to share the load. Backpacking backpacks will always have an internal frame because to carry that much weight, you’ll happily accept any support you can get. As well, most backpacking backpacks have many details that can fine tune the bag to fit your body and balance the weight. From strap adjustments to different hip belt padding, backpacking backpacks really bring the punches when it comes to fine tune adjustments. Hiking backpacks can be a large size range. From small 25L packs to large 70L packs; though a pack that is large from about 50L to 70L+ indicates more of a backpacking backpack because it can hold so much gear. Normally, a hike would never constitute carrying 70L worth of gear. Hiking backpacks can have frames, but it isn’t necessary. If you are carrying less gear, the frame can actually add unneeded assistance by making you carry more weight. However, if you choose to carry more, there are certainly hiking backpacks with frames available, but think of a frame as an option versus necessity. Hiking backpacks may also lack some of the added features that backpacking backpacks have. Hiking backpacks made not be adjustable to the extent that a backpacking backpack is, and it may not have a high-quality padded hip belt. Most daypack styles won’t have a hip belt at all. Other hiking backpacks just have straps for the chest and hips, not a fully padded belt. The line between backpacking and hiking can get blurry. Some people prefer to backpack in to a certain location and then set up a base camp, where they do day hikes from there before trekking all the way back out to the start of the trail. This means they still have to pack like a backpacker, but they may have a smaller pack tucked away to take a lighter load for the shorter hikes. In general, the difference is in the amount of gear you carry and size pack you need. Hikers normally, don’t have to pack on all their gear. Q: What are the benefits of using a hiking backpack? A: A hiking backpack is a great way that is convenient and easy for hikers to carry the gear they need. It’s silly to imagine someone trying to carry multiple items in their arms. Hiking requires free arms to navigate the trails. Hiking backpacks are meant to assist you in carrying what you need on the trail. A great hiking backpack will easily carry all your gear and protect it too. The best hiking backpacks are weather resistant to ensure that you don’t have to worry about a little rain or snow. Hiking backpacks are also meant to bring you convenience. It’s easier to carry all your gear in one secure backpack, so a hiking backpack should be able to pack everything you need. But beyond just carrying it, hiking backpacks should make carrying it easier. The best hiking backpacks will have features that help you balance the weight once you adjust the pack to your body. A better distribution of weight means that you can move easier without tiring as quickly. Your hiking backpack is an investment, but that doesn’t mean it should be viewed only as such. Instead, a hiking backpack should be a companion that you are excited to bring on the trail with you. It should make hiking easier and more enjoyable because it eases the stress on your body as you carry your gear. Q: How to clean and maintain a hiking backpack? A: Every hiking backpack is different, so there isn’t one way to clean a pack. The manufacturer of your hiking backpack should provide a user’s manual or guide that has a section on how best to clean your bag. However, no hiking backpack should ever be washed in a washing machine or dried in a dryer. A hiking backpack is a major investment and the better care you take of it, the longer it is guaranteed to last you. As pristine as your hiking backpack is when you first purchase it, it’ll never return to that state. That’s okay. Hiking backpacks are meant to be used and loved. From sweat and oil in your skin, dirt, kitchen grease, gunked up zippers, and food crumbs, your bag will probably have it all if it is used frequently. All of these different stains and grudge can affect the performance of your bag over time, so to help combat the damage, you should clean your bag often. In general, most bags can be cleaned with a mild soap, sponge, soft brush, and lukewarm water. However, there are some different techniques between a light cleaning and a heavy cleaning. You should lightly clean your bag after every use. To lightly clean your bag, you should empty all pockets and keep them open. Fully open all compartments of the pack and give it a good shake upside-down to get any dirt or particle out. You can dampen a sponge with just water and wipe down the interiors. For the exterior, you can add a little mild soap for any stubborn stains. Then, rinse the spots or wipe it down again with cold water. Allow your pack to fully dry before it is stored to help prevent the possible growth of mold or rot. To heavily clean your bag, you will want to go all out. You can use a vacuum on the seams to get out any dirt or food particles that have become trapped. You can also vacuum the interior of the pack to ensure you remove everything. If your pack allows you to, remove the hip belt and shoulder straps. These can be washed separately with a little soap on a sponge. The hip belt and shoulder straps should then be rinsed under running water. If your frame can be taken out, remove it and set it aside. Depending on your pack, it may or may not be able to be fully submerged. However, most packs with the frame removed, are safe to fully submerge. Check the manufacturer’s user guide or manual to check. With the frame removed you can fill a bathtub or large sink with lukewarm water and mild soap. Submerge your bag and swish it around. You can gently scrub any stains with your sponge. Pay particular attention to places that come in contact with your skin to get rid of sweat and oil stains. Drain completely and refill with fresh water. Rinse your pack as many times as necessary to get rid of all the soap. As always, allow the pack to fully dry before you re-assemble it and store it to prevent the possible growth of mold or rot. Zippers can be tricky. You should remove any particles that are slowing the zipper or blocking the zipper. You can do this with an old toothbrush but be gentle. Many zippers have a water protective coating that can be scrubbed away. If a zipper is stuck and stubborn, you can look for a special zipper lubricant to help it move smoothly again. It can be a process to clean your hiking backpack, but it is an important one. A hiking backpack that is kept clean stands a better chance at handling the elements for a longer amount of time. Your backpack was an investment and you should treat it with care. Yes, a backpack is meant to be used and loved, but a little care can help it go a long way. Proper maintenance and care can add years of use to your hiking backpack and it ensures that your pack is always ready to go for the next big adventure! When it comes to choosing the best hiking backpack, the task can seem daunting. With so many designs, one can feel lost with deciding which hiking bag to choose. This guide helps you break down the design and features of choosing a top rated hiking pack. 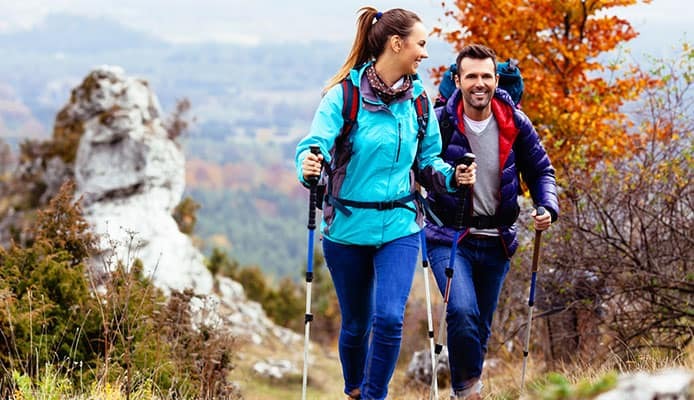 It is important to choose a hiking backpack that you feel confident and comfortable using because you will most likely be using it multiple times and going quite the distance with it. As well, you want to be sure that your pack can handle the load. Hiking backpacks are a tool that is meant to assist you in your hike with carrying your gear. You shouldn’t have to wrestle packing or carrying your backpack. Whether you only use it a couple times a season or use it every week, your hiking backpack will be a companion and you want it to be reliable. The best hiking backpack will ensure that you are hiking with ease throughout the years. Do you own one of the hiking backpacks that made it onto our list? Let us know how it has worked for your outdoor needs in the comments section below.